After graduating with a degree in Industrial Design from Pratt Institute, Stefanie Girard began working in TV production, first in New York then in Los Angeles. Her design experience was honed building tiny models out of recycled objects for stop motion animation, such as a tiny Hollywood sign out of refrigerator letter magnets. She then moved on to set decorating, primarily in children’s television where scripts often called for alien planets and other whimsical themes. Girard then took an unexpected turn, producing how-to TV shows for HGTV and DIY networks and specializing in home arts on Knitty Gritty, Sew Much More, Simply Quilts, DIY Jewelry Making, and Embellish This. 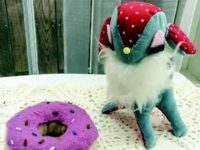 Along with producing how-to content for TV, she has written books and created kits on all sorts of creative topics, such as Sweater Surgery: How to Make New Things with Old Sweaters. Girard currently works to provide online content for publishers and manufacturers in the arts and craft industry. Here’s a conversation with Girard about her work. Q: How do you bring environmental elements into your work? A: Whenever possible I ask myself, “Can I make this from something I already have on hand?” rather than going out to purchase new materials. For example, I took the “Just Paint” class for fun, and I went to a free reuse center for scrap material to use as my painting surfaces. Q: A lot of your projects center around reuse—taking things that would have been thrown away and making something new. Is “trash” inspiring? A: “Trash” is so fun to work with, such as in the case of food packaging—the colors and graphics can be more interesting than standard off-the-rack craft supplies. They tend to come in lots of fun shapes as well and inspire projects all on their own. And most of the time the resources are right in my kitchen cabinet. Q: Can you describe a sample project? A: I created a new work table from recycled materials that I am going to use to make collage art. I have been collecting collage elements, such as clippings from magazines, quote books, fabric scraps, and other bits, that I now want to spread out and use with recycled wood and other surfaces to make art. For a sampling of Stefanie’s crafts and instructions to make them, check out her blog as well as her content on the Cheap Eats and Thrifty Crafts blog. like those used to create this upcycled donut and fawn, are still her favorite.